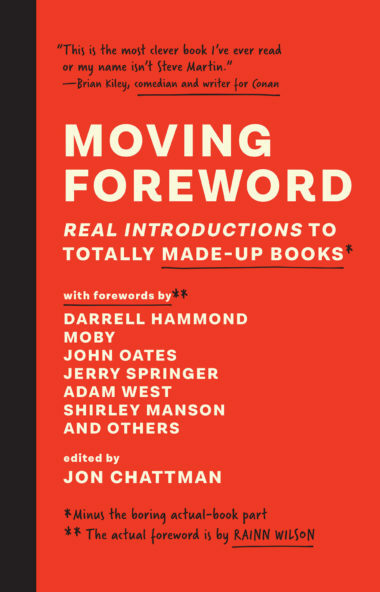 Jon Chattman presents a fun collection of tongue-in-cheek forewords for imaginary books, penned by real celebrities like Moby, Jerry Springer, John Oates and more. A great foreword is more than just a few pages of self-indulgent frippery that comes before a book. A great foreword adds zest. It sets the stage for the page turner you’re about to open, and perhaps even puts you in the locked room where a mystery happens or in the high-button shoes of a year gone by. A great foreword—sometimes—is even better than the book it precedes. So why not skip the boring actual-book part? Moving Foreword is a collection of introductions to imaginary books, written by real celebrities, comedians, musicians, and other writers with something to say. With a real foreword by Rainn Wilson, this book offers a no-holds-barred cacophony of laugh-out-loud funny, poignant, and thought-provoking writing that tackles everything from politics to pop culture, true crime to trout fishing, and Star Wars to skin flicks.
. . . any many more! Jon Chattman has jokingly told Tom Cruise to stop hitting on his wife, enjoyed a Reuben sandwich with Randy “Macho Man” Savage, and somehow ignited Snoop Dogg to sing Dean Martin’s “That’s Amore.” He’s also asked Meryl Streep what she would do in the event of a zombie apocalypse, and she laughingly told him he stumped her. These are just some highlights in this writer/author, marketing expert, online entertainment host, talent buyer, blogger, and man-of-many-hats’s career. Chattman is chief creative officer and president of Moving Forward Consulting. 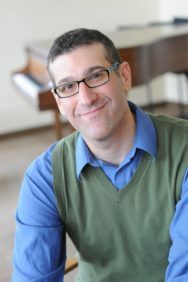 He has extensive background in the entertainment field, specializing in interviewing and writing about those in the music, film, and television worlds. Chattman has authored many pop culture, sports, and wrestling centric books, including Time Heels (Pitch Publishing, 2014), How the Red Sox Explain New England (Triumph Books, 2013), Superfly: The Jimmy Snuka Story (Triumph, 2012), A Battle Royal in the Sky (Pitch Publishing, 2012), I Love the Red Sox, I Hate the Yankees (Triumph, 2011), and Sweet Stache (Adams Media, 2009.) He’s appeared on/in various publications and outlets supporting his projects, including the Opie & Anthony Show, the New York Daily News, the New York Post, and the Chicago Sun-Times, and he was mentioned on The Howard Stern Show. Chattman was selected as one of the “Rising Stars—Westchester’s Forty Under Forty” by The Business Council of Westchester in 2011. He is currently chief creative officer at Moving Forward Consulting, a small social media and marking firm. He resides in Westchester County, New York, with his wife, Alison, and three young children. His hobbies include binge watching Netflix shows, going to the movies, Star Wars, the beach, listening to Bon Iver and pre–Everything Now Arcade Fire, and he is trying desperately to sever his phone from his hand. Send help.